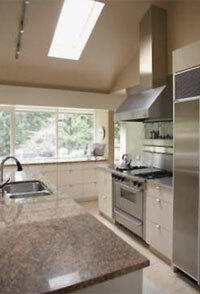 One of the best ways to update your home is to renovate the kitchen. If you want to sell your house, you update the kitchen. If you’re a buyer, a great-looking, functional kitchen is at the top of your list. But if you finally decide to redo your kitchen, where in the world should you start? New Orleans Living asked the foremost kitchen expert in New Orleans, Deborah Oertle, partner of the Kitchen Studio in Metairie, for her ideas. Selling topquality cabinets and countertops, the Kitchen Studio can design a kitchen that meets your needs and answer all your questions along the way. So you’ve decided to renovate your kitchen. What’s first? Oertle suggests doing what everyone secretly does: “Create a want list,” she says. Pretend that you have an unlimited budget and create a list of everything you’d ever want in your dream kitchen. From there, start looking through magazines—interior design magazines, kitchen renovation magazines, even celebrity magazines—to get ideas. This will help your style evolve and help you get a sense of what you’re looking for in a kitchen. It will also help your designer better see what you want stylistically. Oertle explains that the wish list is the first step to truly finding what you want because a designer can look at it and tell you even more than you’d think. This is how dream kitchens are realized. “We want to listen to you and give you what you really want,” she says. One of the hardest tasks, besides deciding what you want for your renovated kitchen, is finding someone qualified to do it. Before making a decision, do some research. Oertle says experience is key. If the person ordering and measuring the cabinets has less than 10 years of experience, the project might be in jeopardy. She also says that the designers you meet with should be excited about the project and about helping you accomplish your goal. “They need to give you the proper respect,” says Oertle, for both you and your projects. You should hire someone who loves his job and wants you to achieve your dream kitchen. Once you have decided what it is you like (and what you don’t) and have chosen a designer, he or she can assist you with visualizing your kitchen. Oertle says designing the kitchen all depends on how the owner will use the space. The budget is always a challenge when renovating a kitchen. Oertle has some great solutions that won’t take away from the style of your kitchen if you’re on a tight budget. The first thing she suggests is to consider a full overlay door on your cabinets because they make it cost effective to build a kitchen. The overlay kitchen doors are sleek-looking while covering a majority of the interior shelving. They are the most popular and are the least expensive to manufacture. Inset doors on the other hand have a much more elegant feel to them because the wood and etching is inset in the cabinet door. However, these are the most expensive. The third option is the standard overlay door, which covers all the interior shelving. The least expensive option, they aren’t exactly the most elegant, but if you’re looking for simplicity, you should ask for the standard overlay. “Most people don’t need expensive cabinetry,” Oertle admits. Remodeling kitchens has become very popular with homeowners, yet trends have changed over the past few years. The new millennium brought a style that leans toward modernism, with sleeker appliances and advances in technology. Now they’ve even invented a refrigerator with a television display on the outside. But for the spring, Oertle says that in the upper market, the English-style kitchen is in, with white offsets and latches. Similarly, the white coastal look is also big.